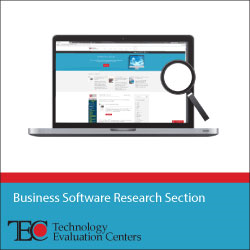 Technology Evaluation Centers (TEC) is an advisory and consultancy firm that helps organizations research, evaluate, and select enterprise software solutions that meet their specific business needs. The company guides midsize companies that require assistance with technology selection decision making. With over 20 years of experience in the market, TEC has achieved recognition in both the enterprise software vendor and end user communities thanks to its straightforward methodology and team of experts. TEC came to SP Marketplace to solve an ongoing SharePoint issue. The TEC IT team was able to deploy the SP Business Suite solution and had multiple departments up and running on SharePoint 2013 in less than three months. HR approval time decreased by 50% thanks to SP Marketplace applications. To handle employee collaboration, employee self-service, and human resources (HR) and IT internal services, TEC was using a combination of SharePoint 2007 and Microsoft Office. While SharePoint was used to handle workflows, approvals, and alerts, Microsoft Office was used to manage information, and calculate balances and various costs. As TEC’s business needs evolved, it required an integrated solution that would handle internal processes and operations in a single place to avoid delays and data inconsistencies; version 2007 proved to be insufficient. This is where the guidance and customization of SP Marketplace came in. TEC wanted to avoid beginning from scratch—as it did with its initial attempt to migrate to SharePoint 2010. TEC preferred to implement a solution with customizable templates that the IT team could easily build on to meet implementation milestones. A bare-bones deployment of SharePoint would have been tedious and prone to trial and error. SharePoint ISV SP Marketplace offered a single package; SP Business Suite, that was flexible and customizable to TEC’s needs, didn’t require coding, and had a competitive price. The Suite included a complete Intranet structure which included integrated modules to provide a powerful business solution. Thanks to the SP Marketplace intranet and department portals (HR, IT, Finance and more), TEC easily adapted the out-of-the-box SP Marketplace configuration to local, Quebec regulations regarding time off requests and timesheet management. Also, employee productivity was boosted thanks to the project tracker module. As TEC is a service company, it relies heavily on project management tools. The SP Marketplace module includes budgeting, task management with cascading tasks, time logs, issues management, alerts and notifications, and document, email and discussion management. Using their Quick Start deployment service, the Suite was installed, configured quickly and ready for customization. SP Marketplace provides a “train the trainer” methodology with the creation of “business power users”—central go-to resources within each organization. Once trained, power users sit down with each department and decide relevant workflows and processes, and necessary user permissions. To help power users, SP Marketplace offers extensive documentation and a standard questionnaire that helps collect information necessary for proper system configuration. This strategy helped TEC better understand its needs and plan accordingly. The TEC IT team was able to deploy the SP Business Suite solution and had multiple departments up and running on SharePoint 2013 in less than three months. To date, the company has seen improved employee collaboration and communication, and faster internal services response to employee requests. HR approval time decreased by 50% thanks to SP Marketplace applications. TEC IT and infrastructure manager Germain Emond is impressed by the SP Marketplace value add.